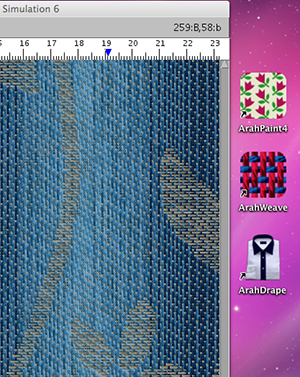 After almost a decade of pleas from our customers, we are both pleased and proud to announce, that Arahne textile design software is available for Mac OS X. We have had it running internally from August 2013, and we gradually rolled it out to the interested customers. In the mean time, we fixed the bugs and simplified the installation process. ArahWeave, ArahDrape and ArahPaint4 look and feel just the same as their Linux versions, same shortcuts, same functionality. They are using XQuartz as the base for display of the user interface. So Mac purists will not be totally happy, but this is the best we can do. ArahPaint5 is written in a different user interface toolkit, and this allowed us to make a pure Mac application, which follows the Mac interface guidelines: Menu on top, ⌘ key instead of Control, standard Mac .dmg based installation. Software will only work on Intel based Mac computers. So any Mac from 2006 onwards will be OK. If you are a Mac user, please follow the installation instructions for full Arahne software demo from here. If you are only interested in textile oriented paint program ArahPaint5, please get it from here. ArahPaint5 is free, can load cards in most jacquard formats, and save them as PNG or TIFF.